The best dental care that any one could ask for. Always top notch and pain free service done by a compassionate and caring staff! I highly recommend Sarah Thompson for all your dental needs! I've always been afraid of the dentist, but this experience made me feel comfortable! The music and the friendly employees helped out a lot! I'm actually looking forward to returning for round 2! Hands down, the best experience at a dental office, ever! Gentle, friendly, knowledgeable, patient, did I mention gentle. I'm very pleased with my veneers and I get compliments at least a few times a week. Thanks for everything. Thank you for giving me something to smile about! After my sleepless nights due to my toothache that needed a root canal, your gentle touch and skillful dentistry ended that pain. Soft touch dentistry also offers affordable payment plan. The clinic has kind staff and the well-run office make each visit a pleasure. And oh, they even greet you on your birthday! I recommend Soft Touch Dentistry at every opportunity. I am from New York visiting family here in Missouri when my husband and I decided to have a dentist visit. The visit was so pleasant that I had to write a review. In my 30 years of life, I have never had a dentist experience as this. The staff and atmosphere was so pleasant that it resembled more of a spa visit than a dentist visit. I couldn't help but notice, not only how nice and respectful the staff was to me, but also each other. The dentist, Dr. Thompson, was the most informative dentist I have ever encountered. She informed me of every current and potential problem and also how to treat it daily. She was patient and very gentle. 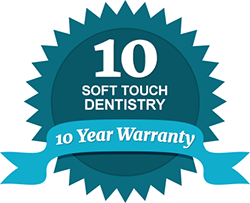 The name of this dentistry, "Soft Touch Dentistry", really exemplifies its treatments. I left feeling informed, relaxed and in control of how to further improve the life of my teeth. Thank you so much Dr. Sarah Thompson and staff for a wonderful experience at Soft Touch Dentistry. I will be certain to visit again soon. This I the best dentist I have ever had. The complete office taff I great and very caring and nice. I have never felt so much at ease with a dentist. I have been hurt before andI wa scared. They completely changed that I didnt even feel the procedures she did. And I had no problems later. I would recommend them over any dentist I know. They are aweome. Her chair ide manner was great , you can tell that they care about what they are doing and for your well being. Dr. Thompson, You are truly an asset to the field of dentistry! You are truly a blessing! My experience was priceless! You have changed my life! For your labor, your talent, your chairside manner, your expertise. I've always hated the dentist. I would only go if it was my absolute last option. Well what can I say, I've been to Dr. Thompson 2 times in the last 3 weeks and it was refreshing. She took her time with me.